Click here to visit the official website of the project. AREA – ARchives of European Archaeology is a research network dedicated to the history of archaeology, with particular emphasis on the archives of the discipline, their promotion and preservation. Initiated in 1998, this ambitious research project aimed, through the study of unpublished archives related to archaeological research, to highlight the role played by this discipline in the construction of the European cultural identity. Carried out in cooperation between many European research organisations, AREA has benefited from various grants from the EU. To promote research on the history of archaeology. To study, catalogue and help preserve the main archives bearing on the memory, achievements and heritage of the discipline. To investigate the interrelations between the development of archaeology and the formation of cultural and political identities. The history of European archaeology is a complex field of research in which national traditions and language barriers have often inhibited a fuller understanding of the disciplinary past, and notably of those aspects involving cross-boundary research programmes and international orientations. Appreciating the impact of antiquarian travellers, the Romantic Movement, the colonial enterprise or the Second World War on the practice of archaeology requires researchers to display a truly pan-European perspective. Indeed, the study of the past has been repeatedly invoked to legitimise political entities, but also to challenge them: alongside extreme forms of nationalist abuses, archaeology has often contributed to a sense of political and cultural identity on regional, national and transnational levels. By organising research projects, regular meetings, workshops, publications and its internet site, AREA seeked to enhance understanding of this multifarious field, to address its theoretical and methodological premises, and to highlight its broader contribution to both historical analysis and contemporary practice. All too often, the history of archaeology is being studied and written exclusively on the basis of published materials, which by their nature convey only selected aspects of the wider archaeological enterprise. The archives of the discipline, however, contain an enormously rich potential for research into the less visible but nonetheless revelatory dimensions of the field. 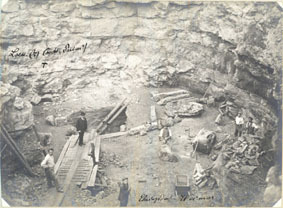 Correspondence, minutes, internal reports, drawings, excavation notebooks, and photographs are not only indispensable resources for historians of science, they often constitute the only remaining documentation regarding numerous archaeological remains and research projects uncovered or undertaken in the past. Scattered as they are across university libraries, museum depots, government archives, and private collections, these sources are often difficult to access and assess for their worth. Besides compiling an online catalogue with the most important or representative of these archival fonds, and besides encouraging archive-holding repositories and institutions to valorise their fonds, AREA also actively engaged in the exploitation of these archives through dedicated research projects. Antiquarian Traditions – Spanning from the Renaissance onwards, these traditions were characterised by philological and numismatic methods, and a joint concern for the local and the universal. Their practices and productions-printed books, plates and illustrations, study journeys, collections etc.-could well be studied in a concerted European perspective. Archaeology Abroad – Archaeological research in Europe has very often been conducted between and across political, linguistic and cultural entities, be it in the form of ‘invisible colleges’ or following scientific and political upheavals. Whether due to constraint or opportunity, the circulation of scholars, ideas, or objects (publications, collections, etc.) has crucial scientific, cultural and ideological impacts on all archaeological milieus. Archaeology under Dictatorship- Several of the dictatorial regimes which emerged during the first half and the middle of the 20th century in Southern and Mediterranean Europe (Portugal, Spain, Italy, Greece) undertook an extensive co-option and instrumentalisation of the archaeological past. Different totalitarian rhetorics and procedures (including Nazi and Soviet inspired) call for a comparative appraisal, in terms of the specific past(s) appealed to, the mobilisation of the scientific community, the mechanics of display, the tools of propaganda, and so on. Memory of Sites – This research axis involved a focus on the documentary record surrounding a number of particularly rich or significant sites, leading to a comparative study of the processes by which they have been discovered, studied, preserved and presented so as to become, each in their way, ‘high-sites’ or lieux de mémoire- sites of national or international importance, at cultural, political or identity levels. Research on these themes was organised in working groups or clusters, where some AREA partners had specific coordinating responsibilities but where all could participate, notably to ensure a cohesive comparative perspective at a European level. Some results of these four themes served as the basis of a travelling exhibition on the history of archaeology, circulating between several locations across Europe. Adapted to the specific history and holdings of the hosting institutions, the exhibition conveyed a coherent collective message regarding the interest and value of the archaeological past, designed to reach both the interested public and cultural and academic professionals. Developments in Information and communication technology included a broadened database of archival fonds, bibliographies, biographies, virtual exhibitions, etc., on the history of archaeology. A new series “Histories of Archaeology” has been launched by Berghahn Books (Oxford / New York) to publish a range of scholarly works relating to the history of archaeology, including edited volumes, monographic studies, translations, readers and anthologies.